Is that a yawn? 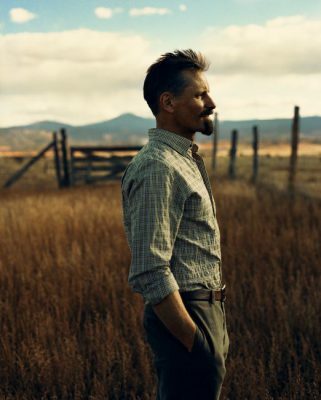 O.K., so Viggo Mortensen’s yawning. He’s seriously tired and in some kind of mood, and let’s respect that, roll with it, because the hours he’s keeping here in New Mexico have just been preposterous. First, there are the 4:00 A.M. wake-up calls he’s grimly endured on the set of Appaloosa. And the locals hired to work Mortensen’s cowboy picture (who plainly adore him) say they’ve never seen such a hard-partying cast and crew as the Appaloosans, and God only knows what happened last night, but there he goes again. Another yawn. This is his only day off and it kind of got shot and he didn’t get to do some stuff he really wanted to do, and then, his obscure Argentine-concert CD got stuck in the player inside his trailer, because he’s never not two-timing the movies with all the rest of his esoteric interests. Some union characters finally smashed the thing open and fished the CD out and he tipped them mighty good, but he’s still got an hour-and-a-half drive ahead of him back to Santa Fe in his Dodge pickup–that is, after he figures out just where and how we’re going to while away the next few hours together. The frostbite-blue eyes snap onto mine for a split second. If the brow is a two-way mirror to the soul, his is cracked in several places by Despair and Inner Torment. Mortensen is justly celebrated in Hollywood for how he telegraphs both, which are reading in his face right now. A face rendered (almost) unrecognizable with that distracting droop of a Wild West mustache, the familiar starburst cleft in his chin forested over by a neat beard. In his black skullcap and flannel shirt, jeans and dirt-caked Tasmanian sheep-station boots, Mortensen, 49, has the sullen affect of a man who’s just found a ticket on his windshield. There had been talk of a country drive, but the sun hit the deck at 5:00 P.M., and so we trudge upstairs at the Abiquiu Inn, a 10-minute drive from Georgia O’Keeffe’s Ghost Ranch, and attempt to make ourselves comfortable in this spare attic that is one of New Mexico’s ubiquitous art galleries. Some folding chairs are produced. His sideline business is coffee-table books–or perhaps that’s Mortensen’s principal business, and acting the actual sideline that supports a pretty expensive habit. A book is handed over, page after page filled with his photography and poetry and published by his own Perceval Press imprint back in Los Angeles (which he calls home). The work is meticulously accomplished and high-production- value, a library of drawings, paintings, photographs, and music by those he’s talent-scouted over the years, some strangers, some friends (and even an ex-girlfriend, Julian Schnabel’s daughter Lola). It is only when he contemplates Perceval Press’s jammed-up assembly line that his voice, a shy, exhausted mumble at the moment, dials up a notch. “I have things I have to finish. Because of this movie, there are four books that my press didn’t put out this fall. Which is not a big deal, but….” He sighs and his whole body seems to deflate as he considers the debut artists and authors he’s let down. At first, Mortensen is so fiercely contained that you can’t help but wonder if he’s one of those Method fanatics who prefers to live in character. He’s been reading The Life of John Wesley Hardin. An outlaw and a gunslinger, Hardin once shot a man for snoring–but always claimed he never killed anyone who didn’t need killing. In Appaloosa, Mortensen’s a gun for hire, deputy to actor-director Ed Harris’s marshal. “Sort of like a lethal butler” is how Mortensen sees his character, Everett Hitch. But you won’t hear Hitch saying ain’t like the rest of them: He’s a West Point man–though without a doubt, the black sheep of the family. Or that’s how Mortensen imagines him. In the McCarthy book, some nuclear episode has reduced the world to a gray-skied ash heap. A father and his only son wander the earth as hobos, survivalists trying to avoid a macabre fate as a feast for any of several roving bands of cannibals, Mortensen is saying, revving for book talk just as his tomato-and-mozzarella salad arrives, which he’ll eat Indian-style on the hard wood floor. Food in the belly, he stretches out on the ground as if on some psychiatrist’s chaise, his wool cap tucked under his head, eyes annealed to some comfortable middle distance. Arms remain folded across the chest, but answers miraculously turn essay length. Published March 2008 in Men's Vogue. Notes: Photographs by Norman Jean Roy.